For a limited time only and subject to the terms below, we can supply and fit a reconditioned Stuart Turner 1.5 BAR Negative Head shower pump from only €450.00 plus VAT in any area of Dublin 1 to 24. We normally charge €550.00 plus VAT but right now, we are offering a €100.00 discount off our normal price. Act now as offer will end soon. We have limited stocks of these reconditioned shower pumps at this price so offer is on a first-come first-served basis and subject to availability.All pump installations are fully guaranteed and come with a 12 month parts and labour “onsite” warranty. (1): This is a reconditioned Stuart Turner 1.5 BAR negative head shower pump like-for-like replacement offer and not a new pump installation from scratch. (2) – Offer price includes a maximum of one hour installation time. A straightforward like-for-like shower pump replacement will take no more than 30 to 40 minutes to complete. If your old pump installation does not have isolation valves installed or working isolation valves, your system will have to be drained down before pump is installed and then filled back up after installation. Dependent on how quickly your system drains and fills up may cause the installation to take more than the allocated one hour install time. If your current set up causes the installation to take more than the allocated one hour, you will be charged after the first hour at a rate of €25.00 plus VAT per quarter hour or part thereof plus the cost of any parts or fittings required. Price does not include the supply of flexi hoses or any other fittings or parts that may be needed to complete the installation. (3) – Pump comes with a 12 month (365 days) parts and labour onsite warranty from date of installation. In the very unlikely event your replacement shower pump should breakdown within the 12 month warranty period, you simply call us on 086 357 9495 and we will arrange for our shower pump repair expert to call out to you and repair your pump onsite free of charge. Evening and weekend warranty repair call outs are provided at no extra cost subject to availability. (4) – Daytime and evening installations within the Dublin 1 to Dublin 24 areas. €25.00 plus 13.5% VAT additional fee for installations in South and North County Dublin areas. (5) – Must have an old Stuart Turner negative head pump as trade-in. €50.00 + VAT additional charge if no trade-in. valves are not working, this may cause the installation to take more than the allocated one hour installation time. See clause 2 above. (7) – Payment is strictly in advance by bank transfer or cash onsite paid directly to the installer. You can also pay by credit card in advance via PayPal but there is a PayPal surcharge of 3.6%. (8) – Limited pumps available at this hugely reduced rate so offer subject to availability on a first-come first-served basis. 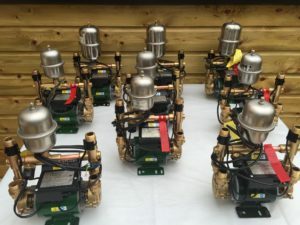 (9) – 12 month on-site parts and labour warranty applies to the pump installation in the exact location in the property where we install the pump. If you move the pump to another location within the property where we installed it or you move the pump to a different property altogether, your 12 months parts and labour warranty will be null and void. 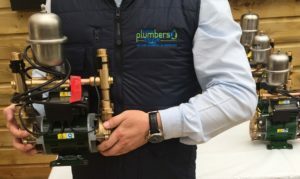 (10) – When we install your replacement Stuart Turner negative head shower pump, it is vital that you do not place any items or clothing on top of the pump as the area immediately around the pump needs to be ventilated. If you put clothes or other items on or around the pump, this will reduce or completely stop natural ventilation of the pump and this will lead to damage to the pump. Damage caused to your pump in this event is NOT covered under your 12 months parts and labour warranty. Covering the pump with clothes or other items is also a serious fire hazard so please make sure that the pump area is clutter free at all times. If you have any questions regarding this offer or any other plumbing or heating service you need, please do not hesitate to contact us on 01-823 2324 or 086 357 9495.